Nothing says Christmas like a great meal to share with your family. But hey, how about skipping the turkey and yams this year and go for a completely different experience? We hereby present you chef Mai’s Vietnamese Fish Cakes. Still not sure what to make for the main course? Go and take a look at the Lamb Curry recipe, too! Place the minced fish ln a mixing bowl and add the red curry paste, shallot, garlic, galangal, kaffir leaves. Mix ln the fish sauce, salt, chopped coriander, spring onions and sliced green beans and kneed firmly together. Put on one hand some drops of oil and spread them over your hand and fingers. By doing this way, the fish will not stick too much on your hands. Roll the fish first as a ball and then form into flat cakes about 5 cm across and 1 cm thick. Deep fry: heat the oil in a deep-fryer to 18O-2OO’C and deep-fry the cakes until golden brown, about 2-5 minutes. Pan roasting: heat some table spoons of vegetable oil in a Teflon pan and pan fry the fish cakes on medium-low fire on both sides till it is cooked (about 3 minutes on each side). 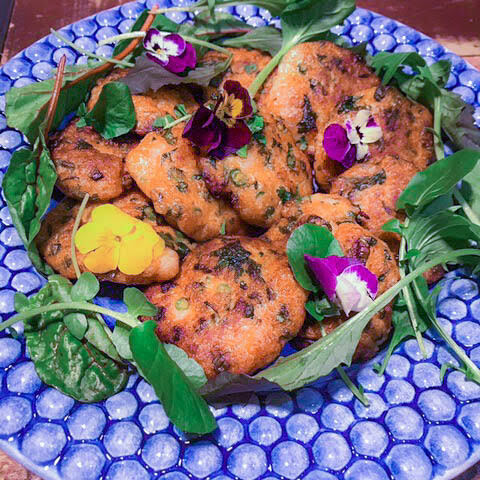 After frying, drain the fish cakes on a kitchen paper thenn arrange on a serving platter. Very nice with sweet chilli sauce or nuoc mam cham.